Creating a HTML5 iPhone Web App! First create two images which will be vital in creating the iPhone web application. The first image is for the app’s icon. This is the icon you will see when you add it to your home screen. Make sure your image is 57px by 57px and save it as a JPEG or PNG file. The second image is for the app’s loading screen. When the icon is selected, the app will start in full screen mode and display a loading screen while it loads the HTML page in the background. This image should be 320px wide and 460px high. HTML5 does not yet work in any desktop browser fully yet but more mobile web broswers are supporting it. You may notice a few differences in the example above from a standard HTML page. There are two link tags to provide the iPhone with the icon and loading screen location. These are the two graphics created in the first section of this post. The two meta tags below scale the site to the mobile device’s screen and enable adding as a web app on the iPhone. The only new tags in this example are the section, header, article and button tags which all make it much easier to create websites in HTML5. HTML5 is worth a google! Make sure you take full advantage of CSS3 when styling your site. Rounded corners and shadows look great on buttons without the need for background images or jQuery! To see this example working go to the following URL on your iPhone and add it to your home screen. 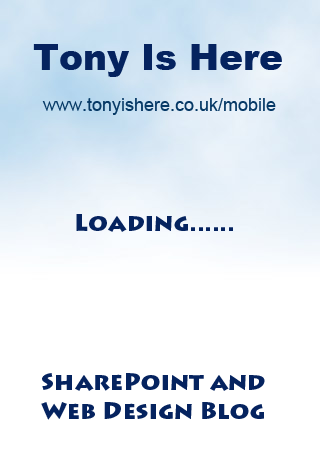 In my next post I will explain how this could also be a SharePoint MasterPage!